I have big news over here, friends, I got a juicer for my birthday. Thrilled is a serious understatement. Obviously the first thing I did was place a huge Fresh Direct (groceries delivered to your door, aka heaven) order of fruits and veggies to juice. The first juice I wanted to tackle would be the standard green juice for breakfast. I present to you a green juice recipe, a la…me. One of my major complaints with green juices is the green taste. I mean, it doesn’t bother me a ton, but I’d rather drink something tasty than something that tastes like raw kale (I hate raw kale). 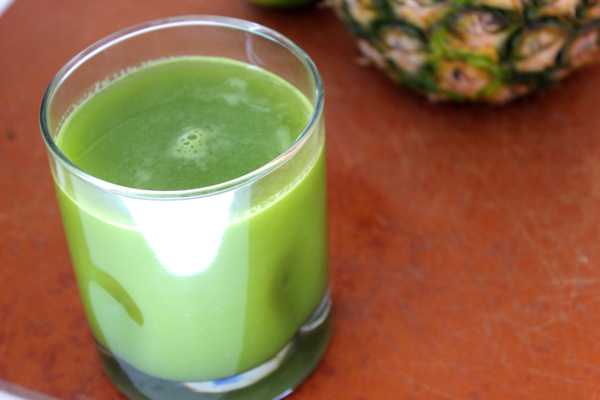 The pineapple in this really adds sweetness and balances out the earthy taste of the kale and spinach. I’ve also made it with grapefruit for a more citrusy taste (and also because I was out of pineapple). The measurements are all very, very exact so if you don’t follow this to a “t”, you will ruin your life. Obviously, I’m kidding. 2. Get your juicer out. 3. Alternate juicing the leafy greens with the softer ingredients, this helps a lot. 5. If you’re really smart, you won’t eat a cheeseburger for lunch. 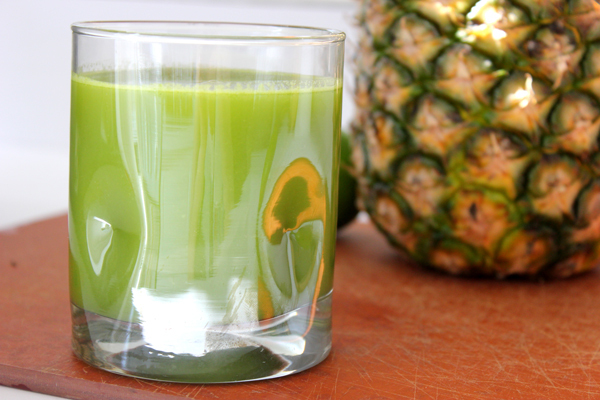 Green juices with pineapple are the best! Yum! I love my juicer and making juices at home, I just hate the clean-up, so lazy! This is awesome! I recently got a juicer too, and like you, I don’t mind the green taste but I would like it a lot better if it tasted better. Lime is definitely key. I have also heard that parsley really helps cut the kale taste. And ginger! Ginger is awesome. I hope you share more juice recipes as you find tasty combos! I’ve yet to try any green juice (mainly because I don’t own a juicer), but I always worry I’d hate the taste! But with pineapple and lime, I feel like this one might be good! So exciting that you got a juicer for your birthday, I’m jealous teehe! I love love love juices but it is tricky because when you buy them they can be on the expensive side, so getting a juicer is definetly at the top of my wish list! I feel the exact same way about cutting out the kale taste-pineapple is great! Another one of my favorites is kale, apple & orange! Enjoy juicing! GAAH! So jealous!!! I think this is going to be our next ‘house’ purchase! Although I really wish it was a new dinning table and chairs….I guess being healthy is cheaper! This will totally be the first thing I juice. Pineapple is so delicious. Made a smoothie this morning … a few chucks of pineapple, couple cups packed of spinach, 1/4 frozen banana, a few frozen strawberries, and canned coconut milk… oh and a raw organic pastured egg bc homegirls got to have her protein (i was hesitant but so far I haven’t died). Pretty tasty. Love love love fresh juice! The only downside is that they’re a pain to clean. I keep mine on the counter so I have no excuse not to use it! I want a juicer SO badly! I don’t really have room for a hefty one, so right now I stick to getting my juices at a juice bar near my apartment. They’re so yummy! Never really thought to use pineapples, but I’m loving this! Which juicer did you get? We have a Omega something, and it’s awesome – our go to recipe is kale/carrot/apple/ginger. I love the idea of how healthy this is but I feel the same way about the gross taste of kale and spinach. Love the tip about how pineapple gives it a little sweetness! Can’t wait to see what other healthy juice recipes you come up with! I love cucumber in green juice. Yummy, yummy.